Only national security, Johnson said, “not the desire of public officials,” should determine when information should be withheld from the public. Ryan Zinke, the US secretary of the interior, would do well to study the history of the law that today his staff seems only interested in weakening. A radical, 52-year-old experiment in government transparency, FOIA was created with the knowledge that freedom only survives when the governors are held accountable to the governed. Freedom of information is, ergo, quintessentially American. 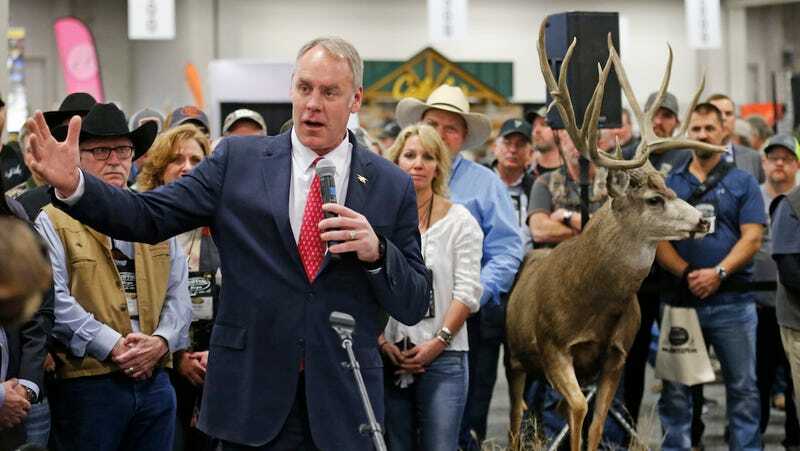 In a September 27th report, only recently acquired by the Washington Post, Secretary Zinke’s Bureau of Land Management (BLM) detailed plans to expedite permits for energy exploration on some 245 million acres of public land—coal and oil and gas leases, drilling permits—as well as permits for myriad infrastructure projects, livestock grazing, and special recreation (read: commercial hunting). The plan is to not only limit how many FOIA requests a single person or group can submit—an idea for which the federal statute offers no basis—but also to make government records more expensive to acquire. In a footnote, the agency writes that “nearly 1,000” FOIA requests were filed with BLM during the 2017 fiscal year, and that in 2016, approximately $2.8 million was spent on FOIA-related costs. It’s worth noting that while many federal agencies have seen an uptick in FOIA requests over the past few years, the Bureau of Land Management is not among them. There has been no sudden influx of FOIA requests at BLM that would necessitate a new plan for how to handle them. In fiscal year 2016, the bureau received 852 requests—138 less that it received 10 years ago, according to the government’s numbers. In fact, the number of FOIA requests at BLM peaked nearly a decade ago. A FOIA log acquired by MuckRock reveals that during the 2017 calendar year, the agency processed only 589 requests. (Totals provided on FOIA.gov apply to fiscal years, which run October 1st to September 30th.) If that total is inaccurate, it would only be because BLM provided MuckRock with inaccurate or incomplete data. Adds Marshall: “FOIA requests aren’t a problem, and agencies shouldn’t try and ‘fix’ them by proposing limits on our right to know. This law exists for the benefit of the public, not the convenience of federal agencies. Since the number of requests at BLM hasn’t risen—and has, in fact, dropped from just a few years ago—one can only assume that Trump’s BLM is either less efficient at processing FOIA requests than the previous administration, or it is more combative when it comes to public transparency. The Bureau of Land Management did not respond to multiple requests for comment.